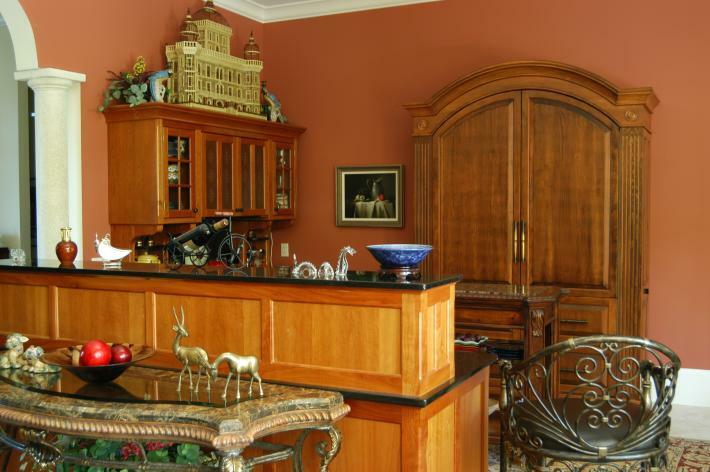 This Great Room kitchen is in the middle of several very formal rooms and is always part of the action in this oceanfront Myrtle Beach home. This view as seen from the living area shows how well just a few super functional workstations can become the furnished extension of the great room. 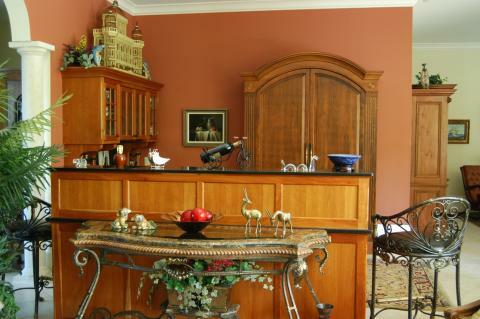 The kitchen features two Hampton’s Cherry and one distressed Colonial Pine freestanding Workstations. The range conceals an oven and microwave/hood behind punched tin doors. 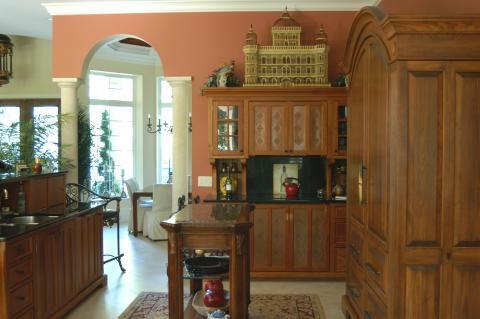 An Arched top Armoire conceals a Subzero 700 refrigerator/freezer behind one door and a full height pantry. The sides of this piece open to reveal full height one can deep pantries, which take the place of many typical upper cabinets. The view into the Dining area and the foyer from the great room kitchen shows the 29 inch deep island workstation that features a Kohler apron front sink and an integrated Bosch dishwasher. Lighting is concealed directly above the sink and sliding doors to the right of the sink hide the coffee maker and more in the upper storage unit that hides the messy countertop from the more formal sitting area. In addition, the upper counter top is in the ‘reach zone’, so it is extremely useful during cooking operations. The view from the more formal great room area and into the less formal family room on the right beyond shows how the kitchen needed to be both formal in appearance and yet quite relaxed and informal in how it is used. The homeowners have used the spaces above, between and around the individual unfitted workstations as opportunities to display items that add personality to the room. This is the same way that we design all the other rooms in our homes. We furnish them and add personality in the spaces.